The German-speaking central European country of Austria is well known for its breathtaking mountains, traditional cuisine, cultural heritage and important role in the history of the world. Austria developed a very high living standard making it a comfortable holiday destination with natural landmarks and a total of nine UNESCO World Heritage sights. 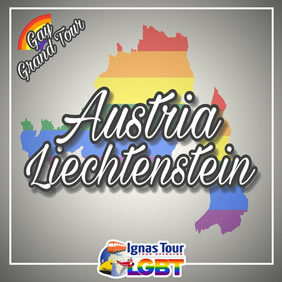 The gay community is organized in all larger cities: Vienna, Linz, Innsbruck, Salzburg, and Graz. Explore this special country with us! Vienna is well known for its music and culture, the coffee houses, opera and its Imperial history, showcased across the city. 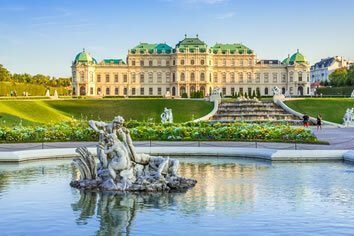 Vienna’s cultural appeal is, in fact, what draws an ever larger number of gay and lesbian travellers to the city. Whilst Vienna does not have a single predominantly gay and lesbian neighborhood, it does have a lively and diverse gay and lesbian scene. That said, don’t expect a large number of “gay only” places in Vienna, but rather an abundance of “gay friendly” and mixed places throughout town. Although many historic figures that have helped shape the city in centuries past are left in a historical closet, Vienna’s young gay couples can be seen walking hand-in-hand along the Ringstrasse. Some of the most fun gay spots in town are located around the Naschmarkt area. The Naschmarkt, a vast open-air food market, is any chef’s dream, connecting the 4th with the 6th district of the city. Here one can find the G&L Community center with the popular Café Willendorf, the ornate Café Savoy and the twentysomethings’ hangouts Chameleon and Mango Bar, among other places. Rainbow Tips: Live the vibrant gay atmosphere in one of the many pubs like 'Heaven Vienna' or 'Why Not'. • Buffet Breakfast and start your special tour with our Gay/Lesbian Guide from the special Belvedere Palace (entrance ticket included), actually two palaces in one. Undoubtedly one of Vienna's most visited historic sites, this splendid attraction consists of two Baroque palaces built for Prince Eugene: the Lower (Unteres) Belvedere and the Upper (Oberes) Belvedere. • Continue to the Museumsquartier, for a short view of this artist place, and the worldwide famous Vienna State Opera, built by the couple of men architects Eduard van der Nüll and August Sicard von Sicardsburg, partners in business and in life. • Then walk along the Ringstrasse, Vienna's main boulevard, over to the Imperial Palace (“Hofburg”), one of the biggest palace complexes in the world and residence and seat of government of the Habsburg emperors until 1918. Today, it is home to numerous museums with outstanding collections, the Spanish Riding School, a congress center, the seat of the Austrian Federal President as well as the historic Heldenplatz. • In the afternoon continue to tour from famous Karlsplatz with the imposing Karlskirche, passing by the Technical University and reaching Kettenbrückengasse 6, the death place of composer Franz Schubert, who died of Syphilis supposedly caused by the only sexual experience Schubert ever had with a woman, although during his life he concentrated his desires on male partners. For more than two years he shared his studio and his bed with the well-known homosexual librettist Johann Baptist Mayerhofer. Explore the house where Schubert died. The exhibits document the last weeks of his life, Schubert's death, the funeral, and the grave of the composer just near Beethoven's last resting place in what was then the Währing local cemetery. • Then continue to the Naschmarkt, the center of today’s gay life, where you will taste some local specialities from one of the many local stands. After passing through the Museumsquartier and the Volksgarten, you will reach the so-called “Theseustempel” built in 1820 by Antonio Canova. Here, in front of the temple, the bronze sculpture “The Winner” was created by Josef Müllner and destined to be one of the “gay monuments” of the city. • Dinner on your own. Overnight in Vienna. 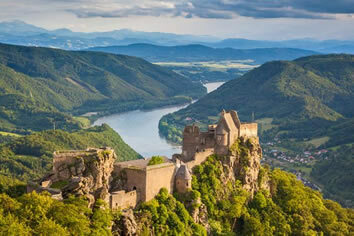 • Buffet Breakfast and be ready to travel to the famous Wachau Valley. • Explore the pretty village of Durnstein, a relaxing cruise on the Danube from Spitz to Melk and the Abbey of Melk. • Afterwards continue to Salzburg. Arrival in this stunning city, surrounded by a beautiful alpine backdrop and the site of some of the most famous scenes from the iconic 1965 musical The Sound of Music. • Dinner on your own. Overnight at your hotel in Salzburg. • Buffet Breakfast and start your special tour with our LGBT Friendly Tour Guide. • Visit sites such as the Mozart's Birthplace, Mozart's Residence, the famous Getreidegasse, the Cathedral, Residenz Palace and Mirabell Palace with its splendid gardens. • Free time in the afternoon, we suggest you to take part to a very special The Sound of Music Tour passing by some of the areas where the movie was shot. • Buffet Breakfast and departure by car or minibus with your private LGBT Friendly Driver to Hallstatt. • During the trip soak in the stunning views as you travel along the shores of emerald Lake Fuschl (Fuschlsee) toward your first stop near Castle Fuschl. Admire the views of this fairy tale-like castle and continue to the village of St. Gilgen, the birthplace of Mozart’s mother. • Take photos of the magnificent scenery from a viewpoint here, and then trace the banks of Lake Wolfgang (Wolfgangsee) to Bad Ischl, an elegant town famous for its spa waters and imperial summer palace (Kaiservilla), a favorite retreat of the Emperor Franz Josef. • Next, journey on through Bad Goisern to a highlight of your tour: Hallstatt, known as the 'pearl' of the Salzkammergut. Free time to discover this special city. • After leaving Hallstatt, stop at Lake Gosau (Gosausee) with the over the glassy lake to the Dachstein glacier in the distance. • Then, journey along the Dachstein Mountain range, and through the ski resort of Russbach to Golling before continuing to Salzburg. • Buffet Breakfast and departure by car or minibus to the picturesque town of Berchtesgaden, situated in the striking Bavarian Alps close to the border of Austria and home to Hitler's infamous alpine fortress, the Eagle's Nest. • Enjoy a unique visit to the fortress followed by a visit to the documentation center and bunkers. 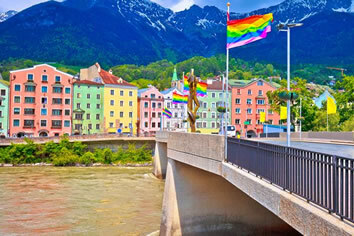 • Continue to Innsbruck and accommodation. • Dinner on your own. Overnight at your hotel in Innsbruck. 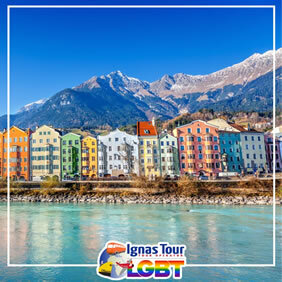 • Buffet Breakfast and be ready to experience a special tour with our LGBT Friendly Tour Guide. • Visit the city which has been an important trading centre since Celtic times, then capital of a Dukedom before being incorporated in the Habsburg Empire. • There is the famous Golden Roof, the magnificent baroque St Jakob’s cathedral and the former Imperial Palace, once home of Empress Maria Theresa, the Stadtturm belfry tower with its excellent views across the city and Schloss Ambras, the Renaissance castle and palace. • In the afternoon, explore the Tyrol region with the Northern Chain Mountains. • Stop also in Swarovski Crystal Worlds in Wattens, more than a glistening paradise of cut glass. This is a unique art and adventure park designed to stimulate the human senses and inspire visitors of all ages. • Dinner in your own. Overnight at your hotel in Innsbruck. • Buffet Breakfast and departure by car or minibus to Vaduz, the capital of Liechtenstein. • Enjoy a very special and funny tour on the City Train, which takes to the historical part of old Vaduz, past the Vaduz vineyards, to stop below the famous Red House which is an ideal spot to take a picture of the panoramic view of Vaduz Castle, and continues through the magnificent, green countryside around Vaduz. The way back to the center takes you past the "Rheinpark stadium", Liechtenstein's main sports stadium. • Free time in the afternoon. Then back to Innbruck. • Dinner in your own. Overnight at your hotel in Innbruck. • Breakfast in the hotel and transfer to the Innsbruck airport. Boutiquehotel Stadthalle is a family-run and eco-friendly hotel with a beautiful garden, individually designed rooms, and free WiFi. It is just an 8-minute walk from the Westbahnhof Train Station and Vienna’s main shopping boulevard Mariahilfer Straße. The Westbahnhof Underground Station (lines U3 and U6) provides direct connections to the city centre. From the nearby Beingasse Tram Stop, you can also get quickly to the city centre, as well as to the picturesque Spittelberg area. An organic buffet breakfast including local products is served in the breakfast room, in the sun-flooded winter garden, or outdoors in the unique green oasis. Boutiquehotel Stadthalle's water is heated by solar panels, and rainwater collected from the roof is used to water the garden. Moreover, all roofs are planted. Hotel Hofwirt’s non-smoking rooms are furnished in a modern or traditional style and feature cable TV and a bathroom with shower and toilet. A tablet with internet access is available in each room free of charge. In the morning, a rich breakfast buffet with many Austrian specialities is served, and the spacious and modern hotel bar is open around the clock. Recently renovated, Hotel Zach enjoys a quiet location in a side street, just a 5-minute walk from Innsbruck’s Old Town and the Main Train Station. Free WiFi is available. A private parking garage is just a 3-minute walk away. Several shops and supermarkets are close by, and the Kaufhaus Tyrol Shopping Centre can be reached in a 1-minute walk. Featuring bright wooden furniture, all rooms have cable TV, a work desk, and a bathroom. The Zach Hotel offers a daily breakfast buffet with fresh fruit and vegetables, as well as traditional Tyrolean bacon. The courtyard includes a seating area and a smoking corner. A fitness room is at guests' disposal free of charge. Guests can park directly in the the driveway at the main entrance to unload the luggage.